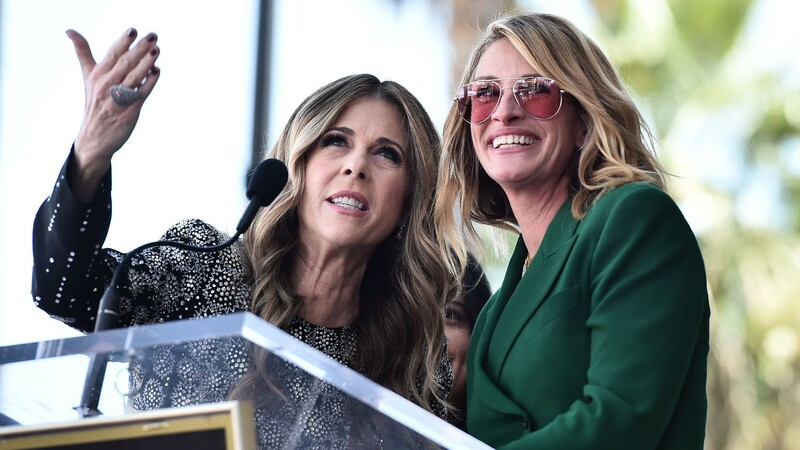 It was nothing but love in Hollywood on Friday, March 29, as the very chic Julia Roberts honored Rita Wilson during Wilson’s Walk of Fame ceremony. Wilson received a star on the hallowed Walk of Fame for her contributions to film, and longtime friend Roberts (who is also friends with Wilson’s husband, Tom Hanks) was right by her side to celebrate her. One video that made its way from the ceremony to the Twittersphere focused on a portion of Roberts’ speech to honor Wilson. Humorous, loving and totally focused on Wilson’s incredible accomplishments, Roberts couldn’t help but gush. Although Hanks was slated to go on after Roberts to similarly give many loving remarks about Wilson’s life and career, we are so thoroughly in love with the best friend love-fest between Roberts and Wilson. Just watching these two women onstage, Roberts sharing her affectionate remarks and Wilson beaming, is enough to make you want to listen in on other conversations these besties might have; they know how to have fun. Furthermore, Roberts’ praise of Wilson is not at all unfounded because Wilson is truly a force to be reckoned with and a true power player in Hollywood. Sure, she earned our attention with roles in films like Sleepless in Seattle and Runaway Bride, but over the years, Wilson has crafted an impressive resume, with credits as a director, producer and singer. Heck, her latest album, Halfway to Home, dropped on March 29, too, coinciding with the Walk of Fame ceremony. There’s no doubt that Wilson deserves this star and if anybody knows it (and is ready to shout it from the mountaintops), it’s her friend of more than 20 years, Julia Roberts.